The University of Manitoba Faculty Association (UMFA) rejected a settlement offer from the university Monday, saying the proposal continues to ignore workplace issues raised by the union since negotiations began in May. The association, which represents some 1,200 professors, researchers, and librarians, has been picketing since Nov. 1, cancelling hundreds of classes. 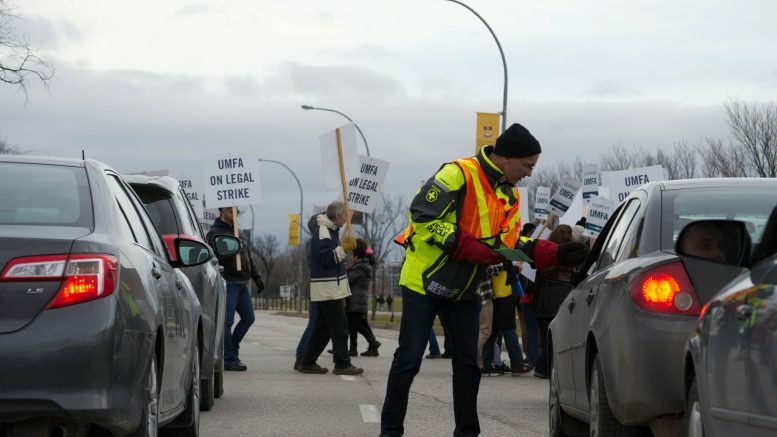 The latest offer, forwarded to the union Sunday after two days of conciliation sessions last week, fell well short of addressing workload, job security, and performance assessment concerns critical to the association, said Mark Hudson, UMFA president. “It is a little bit frustrating for us, obviously,” he said Monday. Hudson said a proposal by the university to set aside $1.5 million to hire grad students to act as instructors or graders over an 18-month period does not adequately answer the union’s call for protections against increasing workloads. He said the one-time fund offers faculty members a paltry 1.5 hours of assistance per week and accused the university of using graduate students for cheap labour. Hudson said language in the proposal also marks a rollback from where previous offers stood on faculty assessments, opening the door to the use of performance metrics. The offer also failed to address job security concerns for instructors and librarians, and included no salary increase, he said. John Kearsey, the U of M’s vice president external, said he is disappointed the offer was refused and disagreed with the assumption the university has made no movement toward addressing the union’s concerns. However, he said some of the union demands are untenable and the university aimed to strike a compromise. “We feel that we at the University of Manitoba have been reaching out to make a compromise on the issues UMFA’s negotiating team says is important to them and those compromises continue to be rejected,” he said. At the request of faculty, he said the administration has been pursuing a one-year agreement that would achieve some stability until the end of March, when it would expire, but accused the union of leveraging students for a better deal. While Kearsey said the university has been inundated with questions from worried students since before the strike began, Hudson accused the university of employing divide-and-conquer tactics in the face of a wave of student support for UMFA. “I think students at the U of M understand that the things that we are at the table bargaining on are the things that go to the heart of their educational experience,” he said. As of press time, no new sessions with a provincially appointed conciliator have been scheduled. The two sides have been in full negotiations since May. UMFA has been without a contract since its last agreement expired March 31. The university also announced Monday that UMFA has filed a complaint to the Manitoba Labour Board. Hudson said the complaint that the university is not bargaining in good faith stems from a development in October when the university abruptly withdrew its financial offer from the negotiating table. In September, the university forwarded a four-year proposal that included a seven per cent increase over the contract’s term. In October, the financial offer was pulled after the province issued a directive mandating the university extend the existing contract an additional year without a salary increase. Kearsey only said that “we will file a defence [and] it will be a vigorous defence to the charges. Hundreds of UMFA supporters, including representatives from Manitoba labour unions, students, and faculty members from universities across the country, converged on the administration building for a rally supporting picketers Friday. The rally began with a gathering at the intersection of Chancellor Matheson and University Crescent before a group of more than 200 supporters marched toward the administration building for a rally on the front steps. Addressing the crowd, University of Manitoba Student Action Network (UMSAN) member Ian McDonald called on students to support the faculty in its push for quality education. “Professors, librarians, students, sessionals, support staff – our struggles are one and the same,” he said. McDonald noted that an UMSAN petition pledging a show of support for faculty has collected more than 500 signatures. Brianne Goertzen, an organizer for the Manitoba chapter of the Canadian Federation of Students and a U of M alumna, said it was the mentorship and guidance of the professors that helped her succeed in her studies. She said it is those one-on-one relationships that are being threatened by increased workloads and class sizes. The rally broke off with a march around the administration building. Despite the large show of support Friday, not all students are standing with UMFA. Third year law student Kyle Mirecki is petitioning the provincial government to legislate teachers back to class. The petition gained the support of 36 signatures in a week. Mirecki said he wants the government to intervene because students are being unfairly impacted by the dispute between administration and its faculty. After the storm: what happens now that bargaining is over?